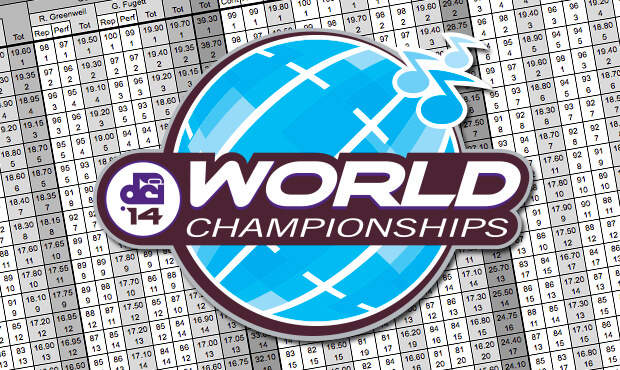 Here is a look at the scores awarded to the 25 corps that competed at the 2014 Drum Corps International World Championship Semifinals, Friday, Aug. 8. Only twice in DCI's history, in 1992 and 2004, did as many as nine corps break 90 points at the World Championship Finals. That could easily happen again this year, as eight corps did so in Semifinals and two more corps were within a point of the milestone. There has never been as many as 10 corps at 90 points or higher at the Finals. There are two judges for GE 1, GE 2, and Percussion, with scores from each of those pairs of judges averaged together for the total caption score. The scores of the two Effect captions are counted for full value, but each of the scores of the three Visual captions (Visual Proficiency, Visual Analysis and Color Guard) and three Music captions (Brass, Music Analysis and Percussion) are first divided in half, with each of those half scores added together for the Total Visual and Total Music scores. While Blue Devils may well be on track to set a record high score in the Finals, their Semifinals score did not set a record. In the 2002 DCI World Championship Semifinals, the Cavaliers scored 99.050 to BD's 98.950 this year, the score differential being only 0.10. The Cavaliers' Finals score in 2002 was 99.150, matched in 2005 by the Cadets, whose Semifinals score that year was 98.125, a full 0.825 under what BD scored Friday night. So, let's have a little speculative fun: If Blue Devils picked up the 0.10 that Cavaliers picked up between Semifinals and Finals, they'd still only have a 99.050. However, if BD picked up the 1.025 that Cadets picked up in 2005, their 2014 Finals score would be 99.975, just a quarter tenth from a perfect 100. The other score of extreme interest was Crossmen making it into the Finals by just a tenth over the Colts due to a one-point warm-up violation. Blue Devils (1st, 98.950) took 1st in every caption except Percussion, in which the corps placed 3rd, just 0.10 under 2nd and 0.20 under 1st. Therefore, a caption sweep is still a possibility, just as the corps had done at the DCI Eastern Classic in Allentown just a week ago (with the highest overall score ever achieved at that show). BD scored a perfect 20 from one of the GE 1 judges and was just 0.10 away from a perfect score from the other GE 1 judge. The corps also scored a 19.90 in all three of the Visual captions; Visual Proficiency, Visual Analysis, and Color Guard. The Cadets (2nd, 96.700) finished 2.250 behind BD in overall score and just 0.15 above Bluecoats. In Prelims, the corps was 1.125 above Bluecoats, so Bluecoats picked up 0.975 on the Cadets in one day. Cadets were 2nd in GE 2, Visual Analysis, Color Guard and Music Analysis, 3rd in Visual Proficiency and Brass, and 4th in Percussion. Bluecoats (3rd, 96.550) took 2nd in Percussion; just 0.10 under SCV's winning score, and tied for 2nd in GE 1. The corps placed 3rd in GE 2 and Color Guard, and 4th in Visual Proficiency, Visual Analysis, Brass, and Music Analysis. Santa Clara Vanguard (4th, 95.650) won Percussion and tied for 2nd in GE 1. The corps finished 3rd in Visual Analysis, 4th in GE 2, 5th in Visual Proficiency, Color Guard and Music Analysis, and 7th in Brass, down two spots from Prelims. Carolina Crown (5th, 95.300) placed 2nd in Visual Proficiency and Brass, 3rd in Music Analysis, 4th in Color Guard, 5th in GE 2 and Visual Analysis and tied for 5th in GE 1, and 7th in Percussion. The Cavaliers (6th, 93.275) were 5th in Percussion and tied for 5th in GE 1, took 6th in Visual Proficiency and Brass, and placed 7th in GE 2, Visual Proficiency, Visual Analysis and Music Analysis. Blue Knights (7th, 91.825) were 6th in GE 2, Visual Analysis and Music Analysis, 7th in GE 1, 8th in Brass and Percussion, 9th in Visual Proficiency, and 10th in Color Guard. Phantom Regiment (8th, 91.550) took 5th in Brass, 6th in Percussion, 7th in Visual Proficiency, and 8th in the remaining five captions. Blue Stars (9th, 89.225) captured 6th in Color Guard, 9th in GE 2, 10th in GE 1 and Percussion, and 11th in the remaining four captions. Boston Crusaders (10th, 89.050) was 8th in Visual Proficiency, 9th in GE 1, Music Analysis and Percussion, 10th in GE 2, Visual Analysis and Brass, and 13th in Color Guard. In the Prelims, Boston's guard placed 9th. Madison Scouts (11th, 87.650) was 9th in Color Guard (up from 12th in Prelims) and Brass, 10th in Visual Proficiency and Music Analysis, 11th in GE 2 and Percussion, and 13th in GE 1 and Visual Analysis. Crossmen (12th, 85.450) had that full 1.00 penalty for a warm-up violation, nearly knocking the corps out of the Finals competition. They tied for 11th in GE 1, took 12th in GE 2, all three Visual captions (Visual Proficiency, Visual Analysis and Color Guard), Brass and Percussion, and 13th in Music Analysis. Colts (13th, 85.350) placed 9th in Visual Analysis, tied for 11th in GE 1 and took 11th in Color Guard, 13th in Visual Proficiency, 14th in GE 2, 15th in Brass, 16th in Music Analysis, and 17th in Percussion. Troopers (14th, 84.775) were 12th in Music Analysis, 13th in GE 2, Brass and Percussion, 14th in GE 1, Visual Proficiency and Visual Analysis, and 15th in Color Guard. Blue Devils B (15th, 82.325) was 15th in GE 1, Visual Proficiency and Visual Analysis, 16th in GE 2 and Color Guard, 17th in Brass and Music Analysis, and 18th in Percussion. The Academy (16th, 81.875) was 15th in GE 2 and Music Analysis, 16th in GE 1, Visual Proficiency, Brass and Percussion, 18th in Visual Analysis, and 20th in Color Guard. Spirit of Atlanta (17th, 81.550) was 14th in all three Music captions (Brass, Music Analysis and Percussion), 17th in GE 2, Visual Proficiency and Color Guard, tied for 18th in GE 1, and was 21st in Visual Analysis. Vanguard Cadets (18th, 80.200) took 14th in Color Guard, 16th in Visual Analysis, 17th in GE 1, 18th in Visual Proficiency, 19th in GE 2, 20th in Brass, and 21st in Music Analysis and Percussion. Oregon Crusaders (19th, 80.100) took 15th in Percussion, 17th in Visual Analysis, 18th in GE 2, Brass and Music Analysis, tied for 18th in GE 1, took 20th in Visual Proficiency, and finished 23rd in Color Guard. Pacific Crest (20th, 78.900) was 19th in Visual Proficiency, Brass and Percussion, 20th in both GE captions and Music Analysis, and 22nd in Visual Analysis and Color Guard. Mandarins (21st, 78.150) was 19th in Visual Analysis, Color Guard and Music Analysis, 20th in Percussion, and 21st in the remaining four captions. Jersey Surf (22nd, 75.800) took 18th in Color Guard, 23rd in Brass, 24th in Visual Analysis, and 22nd in the remaining five captions. Genesis (23rd, 74.075) was 24th in Color Guard and Brass, 25th in Visual Proficiency, and 23rd in the remaining five captions. Spartans (24th, 74.050) was 20th in Visual Analysis, 21st in Color Guard (down from 15th in Prelims), 25th in Brass, and 24th in the remaining five captions, tying for 24th in GE 2. 7th Regiment (25th, 71.475) was 22nd in Brass, 23rd in Visual Proficiency, tied for 24th in GE 2, and placed 25th in the remaining five captions.